Catholic East Anglia: A History of the Catholic Faith in Norfolk, Suffolk, Cambridgeshire and Peterborough published by Gracewing and now available to pre-order, is the official history of the Roman Catholic Diocese of East Anglia, which celebrates its fortieth anniversary in 2016. 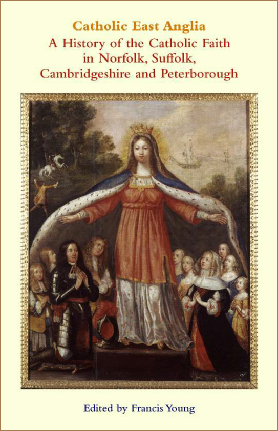 The book consists of seven chapters by different authors covering the history of Catholicism in East Anglia since 1559, as well as an Introduction setting the region’s post-Reformation history in the context of its medieval heritage. The Introduction also includes a brief history of the first (Anglo-Saxon) see of East Anglia. The book features a Foreword by the present Bishop of East Anglia, the Rt Rev. Alan Hopes. The book will be officially launched at the Catholic East Anglia Conference at the Cathedral of St John the Baptist, Norwich, at 2.15pm on Saturday 11 June 2016. The authors who contributed to Catholic East Anglia include Prof. John Morrill, Prof. John Charmley, Joy Rowe, Timothy Fenwick and Fr Tony Rogers. The book also includes a revised version of an article that appeared in the Diocesan Ordo for 2001 by the late Fr Michael Edwards. The idea for a history of the Diocese of East Anglia arose from a study day I delivered in March 2014 for Wuffing Education at Sutton Hoo on the Catholic families of East Anglia. Later that year I met with John Morrill, Fr Tony Rogers and Fr Russell Frost and began planning the book and the accompanying Catholic East Anglia conference. However, the book has developed far beyond what we originally envisaged. At 315 pages, Catholic East Anglia is probably the most thorough diocesan history of any Catholic diocese in England and Wales, although the chapters quite deliberately draw on existing printed sources rather than manuscripts so as to provide pointers for further research for individuals or groups interested in taking further the history of their parish or locality. The first chapter, which I co-authored with Joy Rowe (the veteran historian of East Anglian Catholicism who pioneered the field in the 1950s) focusses on Elizabethan Catholics in the period 1559-1603. John Morrill then takes up the story of seventeenth-century Catholics in the years 1603-1688, the period which culminated in the suppression of James II’s plans for toleration and the destruction of fledgling Catholic chapels in Norwich, Cambridge and Bury St Edmunds. The third chapter, which I wrote, covers the long period between 1688 and 1829 and provides a demographic analysis of the eighteenth-century Catholic community as well as a reconsideration of the effect of French émigré priests from 1793 onwards. The fourth chapter, which I co-authored with Timothy Fenwick, deals with the much shorter chronological span between 1829 and 1850, which saw an upsurge in the number of chapels and missions in the region and the establishment of a short-lived seminary at Giffords Hall in Suffolk by Bishop William Wareing. In Chapter 5 John Charmley tells the story of the East Anglian counties within the cash-strapped and chronically undermanned Diocese of Northampton between 1850 and 1901, telling of churches founded and new parishes established against all the odds. Fr Michael Edwards’ Chapter 6 covers the twentieth century up to 1976, while Fr Tony Rogers, who was ordained in Northampton in 1970 and has ministered in the Diocese of East Anglia since its inception, provides a personal memoir of bishops, priests and people of the Diocese over the last forty years. Those interested in taking research into the history of Catholicism in East Anglia further will find the appendices helpful, since they include short biographies of eighty East Anglian Catholics since the Reformation as well as a brief ‘gazeteer’ of important historic sites associated with Catholicism in the region. Catholic East Anglia is by no means the last word on the history of England’s easternmost diocese but it is intended to provide a sound basis for future study as well as introducing East Anglian Catholics to the rich history of post-Reformation Catholicism in Norfolk, Suffolk and Cambridgeshire. I am delighted that the Diocese of East Anglia, which has never had a diocesan history society, now has a diocesan history that will hopefully provide rich material for parish history groups and interested individuals for years to come. This entry was posted on April 8, 2016 by jacobite.